Looking For New Ways To Cool Off This Summer? Summer is finally here! We have waited all year for our favorite season, but now we are trying to beat the heat! Where do you go when you need to get away from your everyday neighborhood pool with all your nosey neighbors? If you don’t have a neighborhood pool, where can you go? If you are a dog lover, where can both you and your pup go for a cool dip? The good news is, there are tons of places in Atlanta where you can go for your summer “chill”. Let’s explore some ideas! Be sure to check their website for fee’s and swimming hours before heading out, most are cash only. These pools also have events, including dog swimming days and live music, throughout the summer so mark your calendar! If you are tired of chlorine, check out the fresh water holes around Atlanta! With all the creeks and rivers running through Georgia, we have a good bit of options for you to sneak off for a hike, picnic and a swim. On the West side of town, out I-20, there is a great hiking trail along Sweetwater creek. This wide creek bed has plenty of swimming holes and climbing rocks along your hike. There is also a lake that is great for picnics and throwing the ball with the dog. If you are headed up towards Dawsonville, visit the Edge Of The World. A wide creek with lots of flat rocks and swimming holes. This is a very popular area for picnics and inviting the dog along for a swim! Whitewater creek trail is a great ITP option for a swimming hole. This walking trail also connects to the East Palisades trail which boasts amazing views of the river! This one is a dog lover’s favorite, so grab the pup for an afternoon cool off! 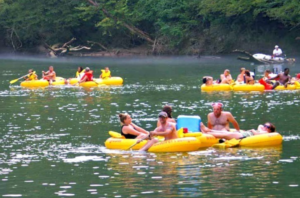 While we are on the topic of rivers, don’t forget to grab your inner tube, cooler and a hat to shoot the hooch! A favorite summer pastime in Atlanta is floating down the Chattahoochee River, stopping along the way to jump from cliffs and rope swings! Once you have marked this off your bucket list, you can officially call yourself a native! If rivers are not your thing, Georgia is home to a lot of lakes. Lake Lanier is very close to Atlanta and offers a water park and campgrounds. Great for a weekend getaway! While this blog has a list of great ideas for keeping cool, we could not have possibly covered all of the great areas to choose from. If you have a favorite place to keep cool during the summer, and we didn’t include it on our list, we would love for you to share it with us!